OK I am not from Vancouver so when it gets pissy out its time to go inside and fire up the creative juices, blog a bit and crack open a stout. We are going to release a new version of the Daisy Cutter in the next month or so. I don’t want to say too much but here is a hint. I think it is going to be one of the coolest things we have done…………but I have had a few stouts. My brother Joel is the brain child of this beauty and if nothing else it will be a really fun project. 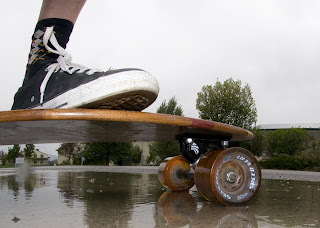 It’s raining cats and dogs in Colorado but I don’t think it will stop me from taking a lead from my friends up north an go out for a cruise……….or slide, there may be no tomorrow.